When this one showed up for sale there was no time for hesitation. It was a ’96 full set and it had recently gone through a full service. Its tritium dial and hand set had been replaced with luminova parts but the original dial and hands were still a part of the kit. To me this was just perfect since I always prefer some proper lume before moldy tritium. This was back in December 2011 and the price it was being sold for was considered really low even back then; hence no time for hesitation. So what else could I do? Why go through the Submariner/GMT phase when I was given the opportunity to go directly for the big boy? Unboxing the Sea-Dweller gave me a special feeling. This was somehow a proper watch. A freakin' legend for god's sake! The feeling of having something that to others might have looked like a Submariner at first glance, when it actually was something a little bigger, better and badder, made me feel so good. “Sorry, if it’s a what? A Submariner? Oh no, you see it’s a Sea-Dweller!” I know it sounds weird but this watch had an obvious impact on me and it somehow made me feel important and gave me a huge confidence boost. Crazy I know but wearing it was like tripping on some good drugs. I was invincible! 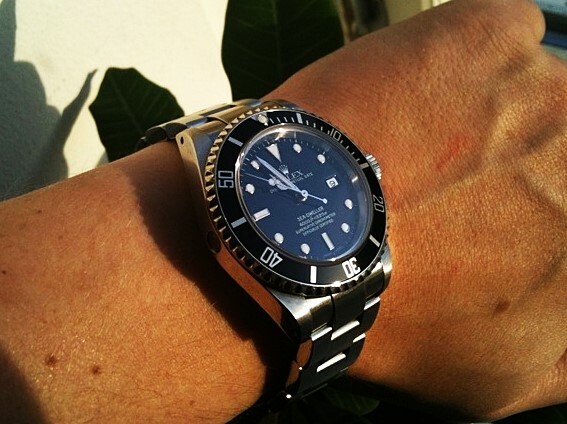 #110 - The Rolex Sea-Dweller 16600. Like all trips the feeling wore off after a while. Instead I started to feel a little uncomfortable wearing such an expensive watch. Had I taken this big step too fast? My previously most expensive watch before the Sea-Dweller had been the IWC 3538 and the difference between the IWC and the Rolex had been more than $1200. I was also a bit reluctant to freeze that much funds in a single watch and I when I started to think about how many cheaper dive watches I was missing out on because of it I decided to part with the Sea-Dweller. The 16600 is one of my all-time favorite Rolex references and I’m forever going to regret selling it. As for most used Rolex’s the prices skyrocketed during 2015 so if I would want another one again I just would have to accept the fact and pay up. Comparing the 16600 to the Submariner 14060M, which is the watch I’ve been wearing the most during 2015, I actually think I prefer the slimmer proportions of the 14060M to the bulkier 16600. However, there is a certain intangible mystery to the Sea-Dweller's that the regular Submariners will never acquire. That's just a fact.